Legitimacy. Relying on your authority position or saying a request accords with organizational policies or rules. Rational persuasion. Presenting logical arguments and factual evidence to demonstrate a request is reasonable. Inspirational appeals. Developing emotional commitment by appealing to target’s values, needs, hopes, and aspirations. Consultation. Increasing the target’s support by involving him or her in deciding how you will accomplish your plan. Exchange. Rewarding the target with benefits or favors in exchange for following a request. Personal appeals. Asking for compliance based on friendship or loyalty. Ingratiation. 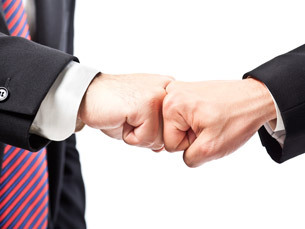 Using flattery, praise, or friendly behavior prior to making a request. Pressure. Using warnings, repeated demands, and threats. Coalitions. Enlisting the aid or support of others to persuade the target to agree. Pressure is typically tends to backfire and is typically the least effective of nine tactics. You can also increase your chance of success by using more than one type of tactic at the same time or sequentially, as long as your choices are compatible.